To welcome her guests, The Queen chose the Cullinan V Brooch (plus her other regular day items); for the state banquet, a suite of diamonds and pearls. The Obamas hosted a return banquet, something that used to be a standard part of a state visit but which we see less and less of these days. 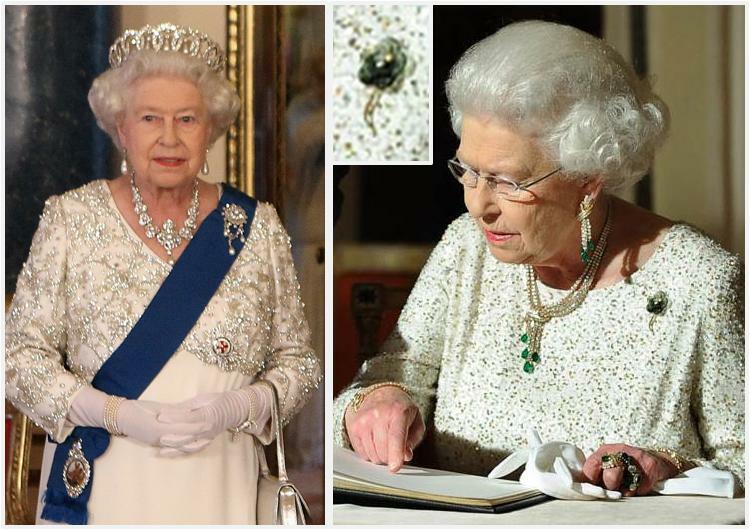 The Queen opted for emeralds, in the form of her Emerald Tassel Parure (necklace, earrings, bracelet, and ring) plus at least one other emerald ring and a gold evening watch. She also wore a new brooch. It has been The Queen's practice in her reign to often wear jewelry given to her by her guests or hosts for the return dinner, and that's the story with this petite flower brooch. It was President and Mrs. Obama's gift to her. * The Obamas selected it from the vintage selection at the Tiny Jewel Box jewelry store in Washington, D.C.; it is an American-made piece from 1950 crafted from 14-karat yellow gold, diamonds, and moss agate.